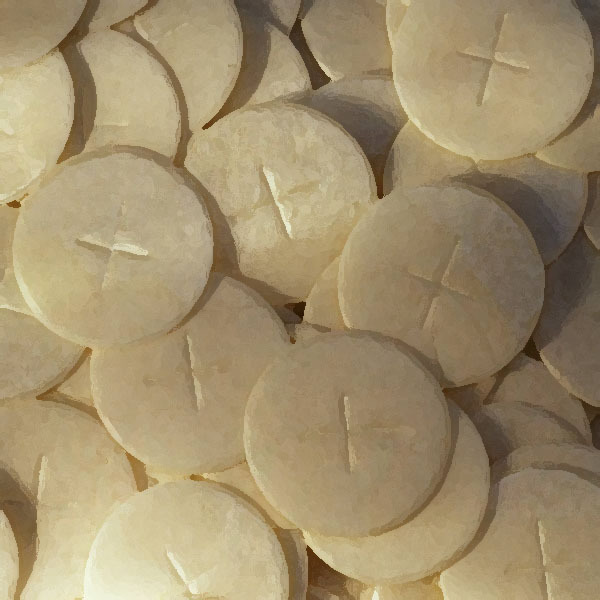 Ordinary bread is a reminder of the Eucharist. Jesus feeds in the ordinary among the people. The fragments left over have been our bread ever since. From this gospel mystery we know we are always worthwhile in God’s eyes. Everyone is fed. We approach the bread of life not because we are saints, but because we need it. We know also that our offering is worth it: 5 loaves and 2 fish of the poorest type. The leftovers on the shelf, the sardines only the poor ate: the boy had no idea of where his offering would lead. We never know where love will bear fruit. God is with us in the ordinary – the God of the table not just the temple. Where we are in life, he finds us, and feeds us most when we are most empty. We have often blocked good people from the table of God for too long. He will feed us always – more than enough love in the heart of God for all. The meal of today has lasted, and the Eucharist is the central prayer and activity of the church. We minister the bread of life now to each other. At Mass we meet the Lord Jesus, in his death and resurrection – each Mass is our entering into this mystery of prayer and love for the world. This is the active love of God, seen also in our service of his people. – bread of earth for the body and bread of heaven for the soul. Lord, thank you for our daily bread. This entry was posted in Gospel of John, Gospel Reflection, Liturgy Resources, Prayer Resources, Scripture, Year B and tagged 17th Sunday Ordinary Time, 5 barley loaves, All are welcome at Mass, Donal Neary SJ, Gospel Reflection, Jesus, John 6:1-15, July 29th 2018, Loaves and Fishes, Sunday Gospel Reading and Reflection, Year B.